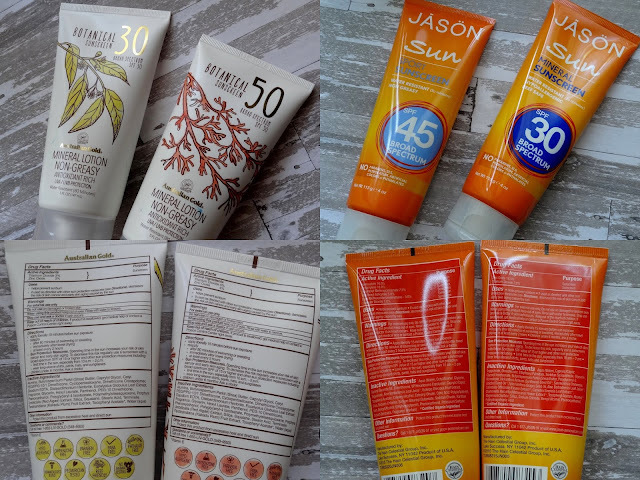 A quick roundup of a few sunscreens with a natural formulations and under $20 that I've been recently testing out. The Australian Gold SPF 30 and 50 Botanical Sunscreens ($15.99; australiangold.com) are both lightweight, easy to apply and don’t clog pores. It does leave a little bit of a white cast and takes a bit of an effort to wash off, especially the SPF50, but that apart it s a good mineral sunscreen formulation. I especially prefer this one for the body than on the face and quite like the SPF 30 one better than the 50. It is slightly fragranced but not a bothersome scent for me. The JASON Sun Mineral SPF 30 ($9; Whole Foods) and Sport SPF45 Sunscreens ($9; Whole Foods) both offer broad spectrum protection and are thicker, heavier feeling sunscreens that do the job really well. Again, with these too, I prefer them more on my body than on my face and they do leave a white-ish cast, but aren’t too difficult to wash off. I also really like the two Alba Botanica sunscreens I tried this time around. The Sensitive Sheer Shield Sunscreen Shield SPF 50 ($11.99; Whole Foods) Fragrance-free version is a very sheer, super lightweight chemical sunscreen. I do love this one quite a bit since it feels like nothing and is easy to wash off. The Fast Fix Sun Stick SPF 30 ($8.99; Whole Foods) is also convenient and the stick form is easy to tote around. Its a combination of physical and chemical filters and leaves no white cast or greasy residue so definitely a winner for me, especially when I need to reapply when I am outside.